Mike Wieringo‘s unique style is well-known in the comics industry. Before passing away in 2007, he worked on plenty of high-profile comic titles including the Sensational Spider-Man, Fantastic Four, the Flash, and Robin. He also launched a great, creator-owned titled called Tellos, alongside Todd Dezago. 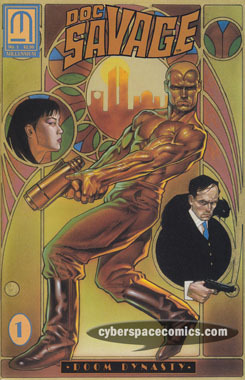 Prior to his big break into DC Comics with his run on the Flash, he pencilled Millennium’s Doc Savage: Doom Dynasty, a two issue mini-series from 1991.
hm. I didn’t even realize the new Doc Savage series was out yet. Millennium actually had quite a few of these series … so I’m assuming they had to be decent enough to keep them going. I remember picking up all of his work on Sensational Spiderman back in the day. It was a notable transition to go from Dan Jurgens to Mike Wieringo, but his style grew on me quickly. And to this day, I can’t think of Impulse (from Flash) without picturing him in Wieringo’s style. Wieringo’s art is wonderful! I also got into him during his Sensational Spider-Man stint and quickly developed an appreciation for his quirky-looking style. On that note, Tellos is a great all-ages, fun read and the dynamic coloring in that book adds even more to Wieringo’s style.